Place all ingredients in a blender in the order listed and run until smooth, stopping to scrape down sides of blender cup once or twice. If you do not have a blender, put all ingredients in a large bowl and whisk, getting the batter as smooth as possible. If there are still lumps, you can ignore them or pass the batter through a strainer. Either way, transfer the batter to as small and deep a container as will accommodate the batter. Cover and let sit in the fridge until ready to use. Can be made a day ahead. If made a day ahead, the batter will oxidize slightly, and the top will turn greyish in color. Ignore that. 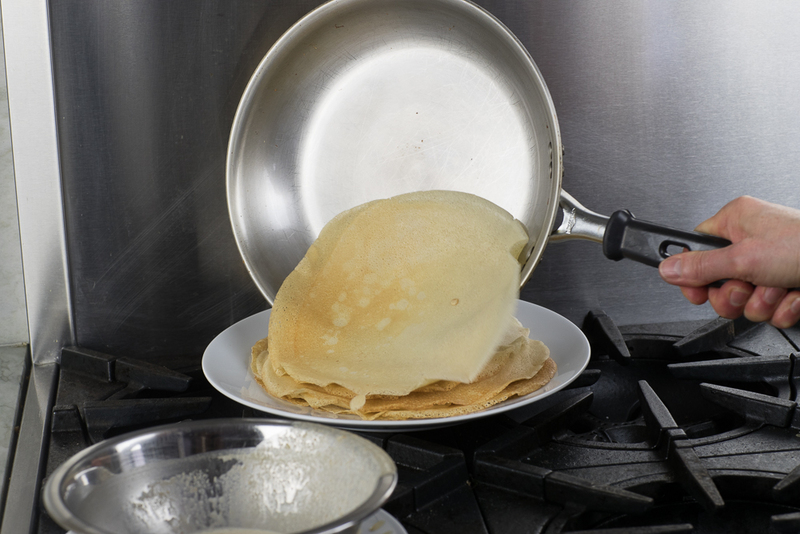 1) You only need to butter or oil your pan for the first crepe. Not for subsequent ones. 2) Select a measuring cup or ladle that matches the amount of batter needed to cover the bottom of the pan. You will need to test this a bit. Typically, if you are using a 10-inch sauté pan, then a ¼-cup measure will be just right. 3) The hardest part of making crepes is learning to determine the correct thickness of the batter. The batter should glide quickly and easily over the pan or griddle. If it is moving too slowly, then thin with a little water. It is better to err on the side of it being too thin rather than too thick. 4) Once again, if you are using this recipe, no need to put wax paper between each crepe as they cook. 5) There are all kinds of pans and special griddles for crepe making. Go online, study the options, see what works best in your kitchen and choose something that will suit your family. If you don’t want to purchase special equipment, they can be cooked in any size sauté pan. There are videos online that provide great demonstrations of the technique using a variety of griddles and pans.